It was our friend, Mik’s, birthday coming up, we normally meet up and buy each other Sunday lunch to celebrate. As he is over in Middlesex, I thought it would be good to find somewhere over that way to review. After much searching online, I found the Frog & Wicket in Eversley. They have a fun website, the roasts are around £10 and we can have as much gravy, potatoes and Yorkshire pudding as we wished (it said so on the menu!). As gravy rationing is one of the (very few) things that annoy me, we have found the place to eat! Reserving was simple, just a quick phone call, we were set for 1pm on Sunday. Unfortunately, due to M25 traffic, we were running about an hour late. Claire gave them a quick call to let them know we have been delayed, the lady was pleased we phoned! Seems like other people are not quite concerned with timekeeping as us. We arrived dead-on the revised time with Mik. 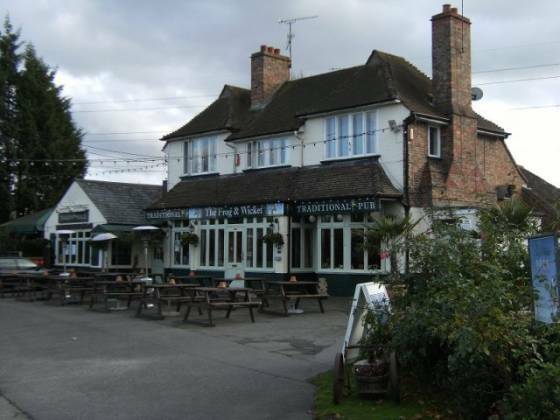 The pub is situated across a cricket green, and surrounded by green grass and some benches outside. A couple of cars were parked in front of the pub, but I drove round to the car park behind. It was completely full, so had to follow suit and park up out front! Walking from the car to the pub, we noticed a “skittles alley” and peeked round the door. 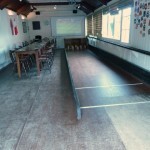 This was a separate building from the pub, having it’s own small bar (with no server at that time), a good amount of tables and chairs, sport being projected on the wall and a long skittles alley. Very novel! Walking through the double doors, we were greeted by one of the waitresses who showed us to our table and gave menus. The area we were sitting was a bit dark, as it was in the corner of the pub. After a while, we got used to the lighting (just a shame, as it was really sunny outside). The menu choices were good, Sunday lunch options were: roast beef, roast pork, roast (free-range) lamb or a trio of meats. Claire was asked what she wanted: Trio please. Birthday-boy (Mik): Trio please. Me: Trio please :-) As I was VERY hungry, we ordered a bread basket to share as a starter. We also ordered drinks, a glass of white wine for Claire, Jack Daniels & Coke for Mik and a pint of blackcurrant and soda for moi. These came over quite quickly. The bread took decidedly longer, but was well worth it – nice and warm french bread with olive oil & balsamic vinegar (and some butter for my uncouth taste). The decor was very much centred around cricket and frogs, with some personal touches such as pictures of (I imagine) locals dotted around the walls. There was even a stuffed boar head on the wall! We were a bit confused by this, as a piece of string and a hoop hung down from the ceiling. More on this later… All the serving staff were wearing black tops; our waitress was friendly, chatting with us without intruding. The pub had an air of professionalism with a local feel. Our food was served around after 15-20 minutes wait. First came out our plates with meat, potatoes, Yorkshire pudding, stuffing, crackling, parsnips, “pigs in blankets” (small sausages wrapped in bacon) and a small puddle of gravy. 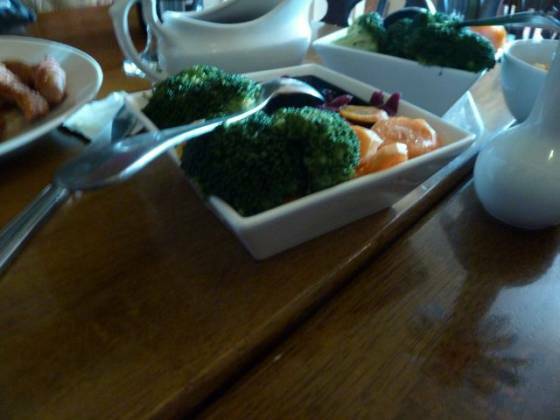 Vegetables were brought out next consisting of broccoli, carrots, red cabbage and swede. Lastly, a gravy jug was placed on the table. Whilst they offered extra gravy, potatoes and vegetables if you wanted it, in my opinion you have to have a hearty appetite just to get through the standard size portion! The Frog & Wicket, Eversley – Trio of Roast Meats! The Frog & Wicket, Eversley – Extra Gravy! So, on to the meat. There were three slices in total, being roast beef, pork and lamb. The lamb tasted great, the beef and pork were not so flavoursome. It all tasted good quality. The 3 large roast potatoes were not very crispy or fluffy, but tasted ok. Vegetable-wise, the roast parsnips were nice, as were the carrots. Claire said the red cabbage was excellent, and the swede was good. The broccoli had a musty taste to it though. This brings me on to the extras… I have to say, probably the most amount of varied extras we have been served in a pub, the pigs in blankets are always a very welcome addition, as is stuffing. The Yorkshires were quite nice, but unfortunately the crackling did let them down a bit – I felt it didn’t have very good consistency. 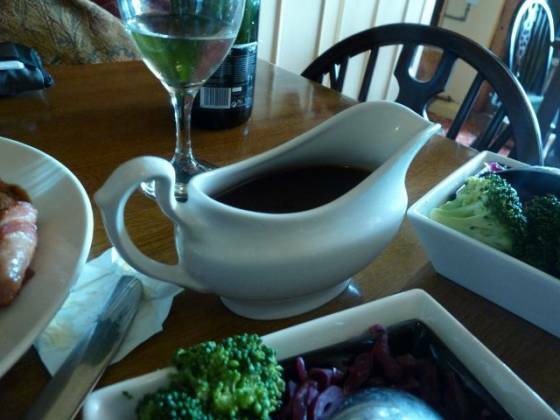 I was very pleased they brought an extra jug of gravy, allowing us to have as much as we wanted. Whilst it didn’t have much flavour, it was nice enough. There was a bit of entertainment whilst we ate, as we discovered the function of the hoop and boar head. Someone came over, picked up the hoop, stood with their back to the opposite wall and let go of the hoop. The aim was to swing the hoop across the room and hook it onto the boar’s tusk. We were all a bit bemused, especially as it was swinging close to Mik’s head! He wasn’t hit though, so all was ok. One person got the hoop on the tusk within 3 swings. Someone else came over about 5 minutes later and gave it 10-15 goes without getting it. This certainly was a bit different! In the background, I heard a bit of music; they had a live saxophone player for some afternoon music sessions. Claire passed on dessert, I decided on the syrup sponge (with ice cream) and Mik bucked the trend and asked for an Irish coffee. After a couple of minutes, dessert was served. 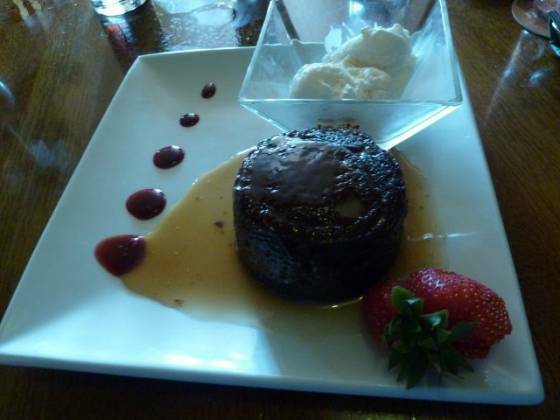 I always seem to choose the traditional, stodgy pudding after a Sunday lunch and this was no exception. Presentation-wise, it was nice, with a dish for the icecream and fruit sauces drizzled around the side. Portion-wise, it was a “good serving”. I have to say though, it tasted wonderful, bringing back childhood memories of puddings after a family Sunday roast. 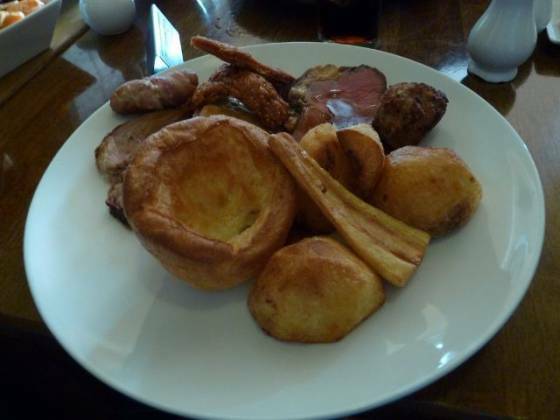 So, to round up – The service was excellent, food portions were great and good meat quality. I liked the fact we could have as much vegetables, potatoes and gravy as we wished. The pub had a local, friendly, lively atmosphere, suitable for families with interesting decoration. The Frog & Wicket is definitely a pub worth visiting if you are in the area and they score 4.5 plates out of 5!